We're all proud of where we're from. No matter where you live, you always take a part of your hometown with you. We love where we live and we let the rest of the world know. We flaunt our mountain biking scars like war badges and gladly tell our stories of near misses with grizzly bears. The same holds true for people around the globe; everyone takes where they were born and raised as a piece of their identity. Our coffee is the same. Every bean brings its unique aromas depending on where it comes from. The local soil, altitude and climate all change the flavours in a cup. Just like us, our coffees are proud of where they’re from, so why shouldn’t we let them brag? That’s why we only roast single origin coffees; we let the coffee speak for itself, by itself. By serving each coffee on it’s own, we allow them to showcase their country, region and farm of origin. When you drink Rooftop coffee, you peek into the farms in Costa Rica, Colombia or Indonesia that played such a monumental role in shaping each bean. By ensuring that each bean can present it’s unique flavours alone, we build a link between the coffee drinker and the coffee farmer. So kick back with a cup of our single origin coffee, and enjoy the spiciness of an Indonesian, the chocolate-y goodness of a Colombian or the beautiful floral notes of an Ethiopian; our coffee will make sure you know where it’s from. When a growing group of cyclists routinely met at Cassis Bistro, owner and avid cyclist Gilles Brassart (owner of Cassis Bistro, Suzette Bistro and The Little French Market) saw the need to create Vélo Café, a space dedicated to their lifestyle and sense of community. It's a place for people who love good food and community. Velo Café is one of Calgary’s first true cycling cafes, a cozy meeting place for cyclists to chat with other enthusiasts, sip on great coffee, eat café fare and watch live cycling events together. The space is beautiful, bright and spacious. There is lots of room for people to hang out with friends and simply enjoy, good food, coffee and wine. You do not have to be a cyclist to enjoy this spot. Vélo Café is proud to be a part of VeloGuide, an application that connects the travelling cyclist to a local guide and a bike across the globe. 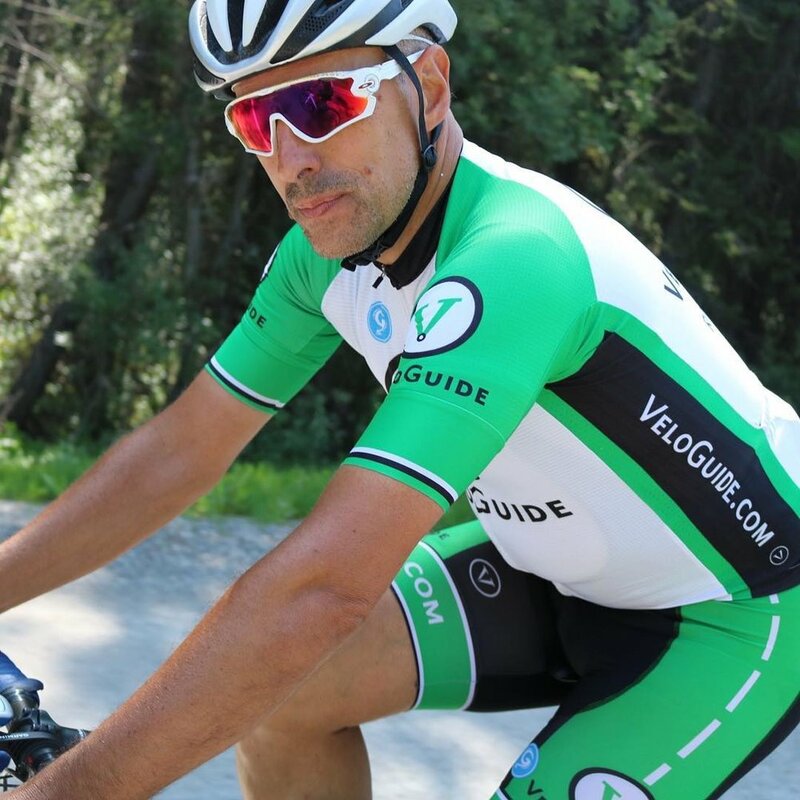 Join the VeloGuide nation and register for your free account today! OR Register for a FREE account today, and use the VeloGuide app to book your next cycling experience! We are inspired by many things in life. Food, friends, good drink and the cycling culture all go hand in hand. We believe in creating a welcoming and inclusive environment for all levels of cyclists and of course, non-cyclists as well. Unified by a love for sharing good food among the people who live in our city and those who visit. Our open space and community tables acts as a unifier, a place of community. Sharing a meal is an excuse to catch up and talk, and possibly meet a new friend. Velo Cafe is a place where you can set aside some special moments to take in what is truly important in life. We believe that great food does not have to be complicated. Trends will come and they will go. Sometimes it truly comes down to simple things - a healthy selection of charcuterie, a tasty bottle of wine, and some good friends with who you can share these times and memories. We are proud to be part of the VeloGuide community. VeloGuide connects travelling cyclists with a bike and a guide all across the globe. We have a great selection of bikes at VeloCafe and some of the most experienced Calgary cyclists as VeloGuides. Check out our ever expanding fleet of road bike rentals. Simply click on the RESERVE NOW button below which will take you to our online reservation system, VeloLister by VeloGuide. There is nothing better than hiring a guide to concierge your entire road cycling experience while visiting Calgary. Simply click on LEARN MORE to view all of our Calgary VeloGuides. Do you live in Calgary and travelling soon? Did you know that you can book a bike and hire a guide in over 64 countries around the world? Download the VeloGuide app today!